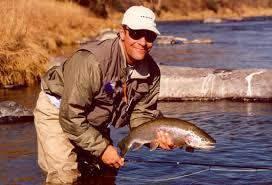 Trout fishing is the most popular fresh water adventurous sport. It can be done on river shores, high altitude streams in lakes and rivers and ice-capped mountains streams. As a beginner, it is vital that you understand the habits of the trout so that you can know how, when and where to fish. Most trout are found in shady places at the bottom of the streams, layered by boulders and gravel, cool waters, pools and ripples. Generally, trout will be found in any river with plenty of land and aquatic insects, larvae, mollusks, small fish and crustaceans. Look in areas where water flows fast. Being fast feeders, trout are likely to be found there. Other places to look for trout are under banks, behind huge rocks, in the deep end of a pool, at the upper end of small brooks, on waterfalls and near rapids. Trout love cold water so aim for cooler waters when looking. Wearing a good pair of sunglasses will aid in locating trout. Live bait is the preferable type of bait to use on trout, or an imitation of live bait. Nymphs make good bait for trout seeing as trout feed on insects mostly. Most insect nymphs are too tiny to be hooked but specific ones such as mayflies, stoneflies, and Dobson flies can be caught on small hooks. Leeches are popular for catching most types of trout. Hook the leech starting with its sucker and present it beneath a light slip-float. Earthworms are irresistible to trout especially if you get fat night crawlers. Other choice baits are flies, crayfish, meal worms, minnows, hellgrammites and aquatic insects. You can also use unnatural alternatives to live baits such as cheese, salmon eggs, marshmallows and synthetic trout baits. Trout fishing can be done all year round and give a good catch, except during winter when waters tend to get icy. Next wiki page: A very Fishy Industry! For more information, visit Video Fishing Knots. This site offers dozens of instructional videos, including videos about fly fishing knots and the infamous Palomar knot.